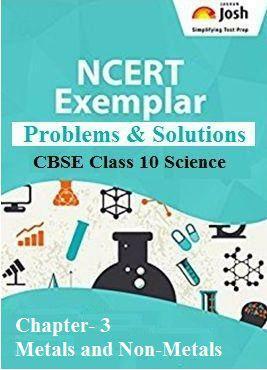 In this article you will get CBSE Class 10 Science chapter 3, Metals and Non-Metals: NCERT Exemplar Problems and Solutions (Part-III). Every question has been provided with a detailed explaination. All the questions given in this article are very important to prepare for CBSE Class 10 Board Exam 2017-2018. Here you get the CBSE Class 10 Science chapter 3, Metals and Non-Metals: NCERT Exemplar Solution (Part-III). This part of the chapter includes solutions for Question No.1 to 36 from the NCERT Exemplar Problems for Class 10 Science Chapter: Metals and Non–Metals. These questions include only the Long Answer Type Questions framed from various important topics of the chapter. NCERT Exemplar problems are a very good resource for preparing the critical questions like Higher Order Thinking Skill (HOTS) questions. All these questions are very important to prepare for CBSE Class 10 Science Board Examination 2017-2018 as well as other competitive exams. Question. 59 A non-metal A which is the largest constituent of air, when heated with H2 in 1 : 3 ratio in the presence of catalyst (Fe) gives a gas B. On heating with O2 it gives an oxide C. If this oxide is passed into water in the presence of air, it gives an acid D which acts as a strong oxidising agent. (a) Identify A, B, C and D.
(b) To which group of the periodic table does this non-metal belongs? Ans. The largest constituent of air is nitrogen gas so the A must be nitrogen gas. Reaction of nitrogen with hydrogen in the presence of Fe catalyst forms ammonia (NH3) gas. It is known as Haber process. Ammonia reacts with water to give nitric oxide (NO) which further oxidized to form NO2. Reaction of oxides with water in the presence of air (O2) results nitric acid (HNO3). (b) Nitrogen has electronic configuration 2, 5. Thus with having 5 valence electrons, nitrogen belongs to group 15 of periodic table. Question. 60 Give the steps involved in the extraction of metals of low and medium reactivity from their respective sulphide ores. (i) Roasting- Heating of metal sulphide in the presence of excess of air to form metal oxide. (ii) Reduction- Metal oxide can be reduced to metal in the presence of reducing agent at high temperature. (ii) Reduction- Metal oxide can be reduced to metal in the presence of reducing agent like coke or aluminium at high temperature. (a) Reactivity of Al decreases if it is dipped in HNO3. (b) Carbon cannot reduce the oxides of Na or Mg.
(c) NaCl is not a conductor of electricity in solid state whereas it does conduct electricity in aqueous solution as well as in molten state. (d) Iron articles are galvanized. (e) Metals like Na, K, Ca and Mg are never found in their free state in nature. (a) Since nitric acid is an oxidizing agent so it reacts with aluminium and forms a layer of aluminium oxide over metal surface which further reduces the reactivity of metal. (b) Alkali and alkaline earth metals are very reactive and readily react with oxygen to form their stable oxides. The reduction of these metallic oxides with carbon requires very high temperature and at that temperature metals react with carbon to form their corresponding carbides. Hence they cannot reduce with the help of carbon as reducing agent. (c) NaCl is an ionic compound. In solid state, oppositely charged ions are held tightly with strong metallic bond. So neither metal ions nor free electrons can move from their position. Therefore NaCl and other ionic compounds cannot conduct electricity in their solid state. In molten state or in aqueous, the free electrons and metal ions are free enough to carry charge which makes them good conductor. (d) Galvanisation is a process of formation of thin layer over metal surface. It prevents further contact of metal surface with atmosphere and reduces the corrosion level. So iron articles are galvanized by making a thin layer of zinc over them. Since zinc is more reactive than iron so it will react first and protect iron surface. (e) Na, K, Ca and Mg are alkali and alkaline earth metals. They are most reactive metal and readily react with atmospheric oxygen and other gases. Therefore they are found in nature in the form of their compounds. Question. 62 (a) Given below are the steps for extraction of copper from its ore. Write the reaction involved. (i) Roasting of copper (I) sulphide. (ii) Reduction of copper (I) oxide with copper (I) sulphide. (b) Draw a neat and well labeled diagram for electrolytic refining of copper. Question. 63 Of the three metals X , Y and Z, X reacts with cold water, Y with hot water and Z with steam only. Identify X, Y and Z and also arrange them in order of increasing reactivity. Ans. X reacts with cold water so it must be very reactive like alkali metals, sodium. Sodium reacts with water to form sodium hydroxide and hydrogen gas. Y metal can react with hot water so it must be little less reactive than X. So Y can be magnesium (Mg) which reacts with hot water to form magnesium hydroxide. Metal which reacts with steam must be iron that forms iron (III) oxide with steam. Question. 64 An element A burns with golden flame in air. It reacts with another element B, atomic number 17 to give a product C. An aqueous solution of product C on electrolysis gives a compound D and liberates hydrogen. Identify A, B, C and D. Also write down the equations for the reactions involved. Ans. Element ‘A’ that burns with golden flame is sodium (Na). Element ‘B’ with atomic number 17 is chlorine (Cl). Sodium and chlorine react to form sodium chloride (NaCl) which is an ionic compound. The aqueous solution of sodium chloride, also called as brine when goes through electrolysis, forms sodium hydroxide (NaOH), hydrogen and chlorine gas. Question. 65 Two ores A and B were taken. On heating, ore A gives CO2 whereas, ore B gives SO2. What steps will you take to convert them into metals? Ans. If an ore gives carbon dioxide gas on heating it means it is a carbonate ore. So it should go with calcination step in which metal ore is heated below its melting point in the absence or limited amount of air. Similarly, calamine (ZnCO3) is heated to give zinc oxide (ZnO) and carbon dioxide. Zinc oxide can convert to metal in the presence of reducing agent like coke. Another ore, B gives SO2 so it must be a sulphide ore. Metal can be extracted from suphide ore with the help of roasting which is a heating process in the presence of air. Like copper(I) sulphide is heated in the presence of oxygen to give copper (I) oxide and sulphur dioxide gas. Later copper (I) oxide (Cu2O) and copper (I) sulphide (Cu2S) heated together to form copper metal and sulphur dioxide gas is expelled out. Next Article CBSE Class 10 Result 2017: How to tackle the stress?